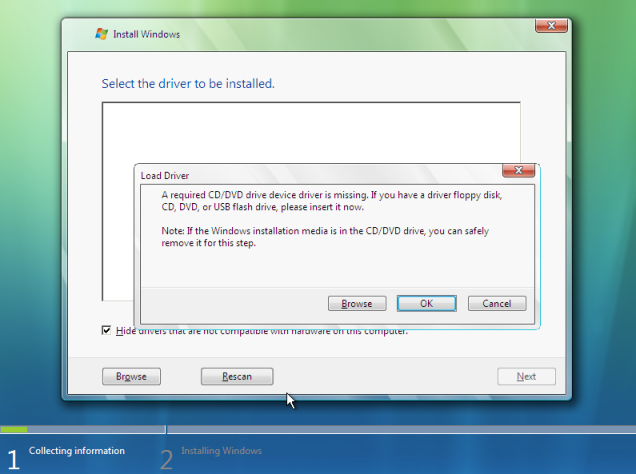 "A required CD/DVD device driver is missing. If you have a driver floppy disk. CD, DVD or USB flash drive, please insert it now"
This annoying dialog box has certainly created a great deal of hardship among those who are trying to install Windows 7 from the USB flash drive. Whenever you create Windows 7 installation disk using the USB flash drive , you are surely bound to incur this stupid and pretty lame error ( for installing from USB flash drive ). Many of the users confuse this and try to install the CD/DVD drivers from the Motherboard's driver DVD or the drivers downloaded into a pen drive and use them to check whether it settles the issue. But to one's disappointment, this will not clear the problem. The thing is because when Windows 7 installer loads, it resets all the USB connection and thus it forgets from which USB port it used to read the installation data. But when you reinsert the installation USB flash drive, it will detect the drive and continue to work like usual. Hope this one helped you out. Keep tuned for more updates !! !